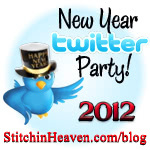 Mark your calendars … our friends at Stitchin’ Heaven are organizing a New Year’s Eve Twitter Party again this year. It’s sure to be loads of FUN and there will be tonnes of wonderful prizes! Topic: Out with a Bang! Not sure how to use Twitter and join the fun? Check out this blog post with all the details, or send me an email and I’ll try to help out. RSVP on Facebook and check out the wonderful prizes that will be awarded. Sounds like fun…don’t know what our plans are yet. I have never used tweetchat before – this should be interesting!